By controlling water quality, distribution of sub stances, and dissipation of solar energy, the landscape managers (landholders, farmers, foresters) influence to a large extent the water cycle as well as the landscape sustainability. Supporting short water and substance cycles by wisely reintroducing the vegetation can lead to suprisingly profound positive small scale cli mate changes. The vegetation has to be carefully and intelligently distributed according to the landscape morphology, so that matter flow, and hence the loss of nutrients and base cations, is reduced (see Figure 7). Rapid flow of surface water causes loss of matter and nutrients from the soil by exporting them to the sea. 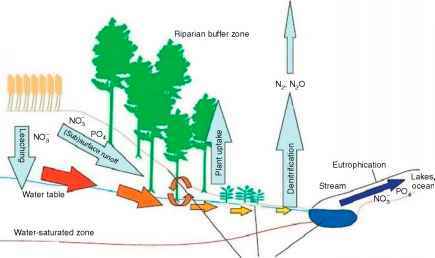 Figure 7 Model for sustainable restitution of a catchment by closing its water and matter cycling. Comparison of the present stage and stage after adaptation. Adapted from Ripl W, Pokorny J, Eiseltova M, and Ridgill S (1994) A holistic approach to the structure and function of wetlands, and their degradation. In: Eiseltova M (ed.) IWRB Publication 32: Restoration of Lake Ecosystems - A Holistic Approach, pp. 16-35. Slimbridge, UK: International Waterfowl & Wetlands Research Bureau. In a sustainable environment, the lateral transport of dissolved mineral ions has to be as low as possible. By enhancing the vertical (soil-air) flow of water by transpira tion, plants reduce the lateral flow of water, thus also slowing down lateral transport of matter. Particularly sen sitive to the leaching of the nutrients from the soils are the upper catchments. It is therefore a priority to cover them with well established vegetation, with a special focus on riparian zones along watercourses managed as buffer/ retention zones. Dissolved material retained by vegetation may be harvested and used to recycle the accumulated nutrients and bases. In water source areas, springs, and the confluences of rivers, the original wetlands should be recreated, especially in nonproductive or infertile areas. This would not only support closing of both matter and water cycles but would also help to even out discharge hydrographs by reducing the possibility of flood events. The capacity of farming practices for ressurection of a degraded landscape and influencing local climate was shown in Australia, although only on a small scale. Within 10 years, Peter Andrews succeeded in changing a heavily deteriorated farmland to a place with renewed water cycle and vegetation cover and improved soil quality ('natural sequence farming'). The project was successful enough to eventually convince the Australian government to support the practices. However, these efforts can only be widely succesful when organized on a decentralized basis supported by regional policies using integrated economic measures to ensure an autonomous resource pool that could be developed and managed by the local inhabitants. A systematic effort to spread these means of resourceful control of temperature distribution and water and matter fluxes in the landscape onto greater areas should be the most important interest of future water cycle management. Founding and interconnecting small units of functioning landscape would certainly also have a large scale positive effect on climate at the regional and global scale.